What types of bonsai trees can you design? When the Chinese art of Penzai, planting trees in small confined vessels, reached Japan, it took a completely different dimension to it and evolved into what we now know as Bonsai. This beautiful art form has captured the imagination of people all around the world and has become a serious art form practiced by enthusiasts all around the world. 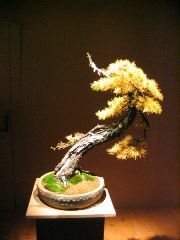 With the passage of time, this art form has evolved a lot and now we find many different bonsai tree types. There are many different styles followed to grow bonsai trees. They could be classified as follows. The list could actually go on and on. The different bonsai tree designs that can be conceived based on their style is actually left to the creativity and imagination of the human mind, and it being limitless in its imagination we could have unlimited designs of bonsai trees defined by their unique cultivated style. We can also categorize bonsai trees based on their dimensions ranging from tiny size which could be as small as 1 to 3 inches in height to a large size which could grow over 40 inches in height. 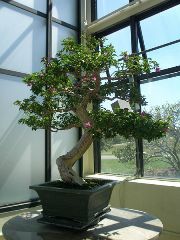 Types of Bonsai Trees can also be classified on the criteria of Indoor Bonsai or Outdoor Bonsai. Generally trees which are vulnerable to climatic conditions are considered for indoor bonsai while those which are weather hardy are best suited for outdoor cultivation. Indoor bonsai tree is cultivated keeping in mind the indoor environment of a house. Generally tropical plants and drought resistant houseplants are chosen for the indoors. Since tropical plants have a very little dormancy period you can even expect to sea a fully leaved indoor tree during the winters as well. With your own creativity and imagination you can create any form or style of bonsai plant and call it your own. 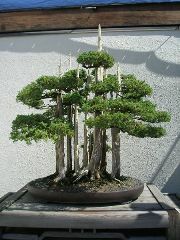 Types of Bonsai Trees can also be defined based on the kind of species used for cultivating the bonsai. All these different types of bonsai trees give you an opportunity to express yourself in your own unique way. The art of Bonsai helps you stay closer to nature and thereby helps you to be at peace with yourself. The sense of satisfaction and accomplishment derived by growing your own type of bonsai trees is something to be treasured for a lifetime.